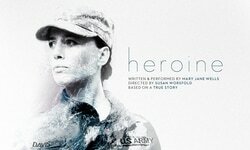 ﻿Heroine is a one woman show, written and performed by Mary Jane Wells. We are so happy to be invited to debut in the USA at THE KENNEDY CENTER in Washington DC, Feb 12-14th 2020. This is a wild dream come true. at Assemblyfestival.com, part of The Edinburgh Festival. Made in Scotland is a curated showcase presenting world class work - the 23 best shows nationally. Heroine was part of this showcase and was longlisted for The Amnesty Freedom of Expression award ​and won runner up in the prestigious Scottish Theatre Arts Club Award against a critically acclaimed shortlist that included the Traverse's Ulster American, Summerhall's Achilles, NTS' First Snow, Premiere Neige. I want to put this story into the world like a compassion grenade - but God save us from actors who try to be Noble. It is and intense story told with humour and a lightness of touch. Also, the play is not a piece of political theatre pushing an agenda or a specific piece of legislation, but one soldier's story. Artistic energy and healing energy are the same thing, with different focus. I would like to unite them both in a high vibration in this work. Nadine George ( a mentor and voice practitioner with whom I have worked intensively) once talked to me about hearing the voice 'déchirez le coeur' in the text. She was referring, I believe, to how you can hear the heart tear in someone's voice as they speak. The predecessor to her work, Alfred Wolfson, fought on the front line in WW1, and one line of artistic enquiry in her work springs from a thought he had: "How can there be so much life in the voice of a dying soldier?" As a result, her technique helps each actor to directly tap the wellspring of authentic humanity we all have inside, and is profoundly life-affirming. I want to give voice to this particular story so that the audience who watch it are held and moved by it, so that it can be part of a larger story that can peaceably become past, and so the woman to whom it belongs does not feel alone when she walks in it everyday. We are looking to tour further. America has the most powerful military in the world. I am not an American, but my choice to live and work in America rather than Britain currently is reflected in my artistic decisions. I have been fascinated by what is specifically American in comparison to my native culture since arriving, and attract projects in which outsiders are part of the creative skeleton. Heroine is not an anti-American piece nor a polemic for or against war, but a pro-human story that is specifically American, specifically veteran and specifically LGBT. My percentage of the box office raised from this project will go to Protect Our Defenders.